It’s a pdf only, so I bought it, printed it out, and started fitting. That’s where the *fun* started! First of all, it’s a petite-only pattern (I used size 21, which corresponds to a regular Burda size 42.) Now, if you know me, you know I’m not petite! I’m 5’9″, with long arms and long legs. I’ve never started with a petite pattern before. Adding length to pattern parts is not really difficult, however, so I started with comparing my measurements and the pattern measurements. Almost all of my lengthening needed to be in the upper bodice. I ended up adding 1.5″ above the dart points on both the front and back bodice, the assymetrical right center front piece (that curves up to the neck,) and the flounce. The sleeves needed only 0.75″ added, half above and half below the elbow dart. That I only needed an extra 0.75″ is really odd, because I usually have to lenghten long sleeves by 1″ on non-petite patterns. I didn’t add any length at all to the skirt. I tried my muslin on, and, boy, was this made for a strangely-shaped bust! The distance between dart points was 11″; mine should be about 8.5″. I’ve never had this issue with such widely-spaced dart points! In addition, the darts as drawn made for a very pointy look – think vintage Madonna! So, I had to lengthen the darts, and curve and taper the stitching to avoid the cone shape. It took a lot of try-ons to get that bodice looking good! In addition, I did my usual square-shoulder adjustment, and lowered the right shoulder an additional 0.25″ in front. Again, as usual, I needed to take in 0.25″ on each side of the back neck. The shoulders were not wide enough to accommodate a dart, so I curved the center back seam in .25″, starting about 4″ below the neckline. I ended up taking in the front neckline a bit at the top of the side bodice pieces, as well. These are very slim sleeves, so I did a 1″ full biceps adjustment. I like the fact that Burda patterns often have a shaped center back seam, but this one was a little too shaped for my back, so I partially straightened the seam, adding a little at the waist, and taking in a little at shoulder blade height. This pattern had no seam allowances, so I added 0.5″ seam allowances all around, and 1″ sleeve and skirt hems. I knew the waist would be a little tight 😦 so I cut out the dress with 1″ side seams. The fabric is Stretchy Suit Weight RPL – Charcoal from Gorgeous Fabrics. It feels nice and is comfy to wear. 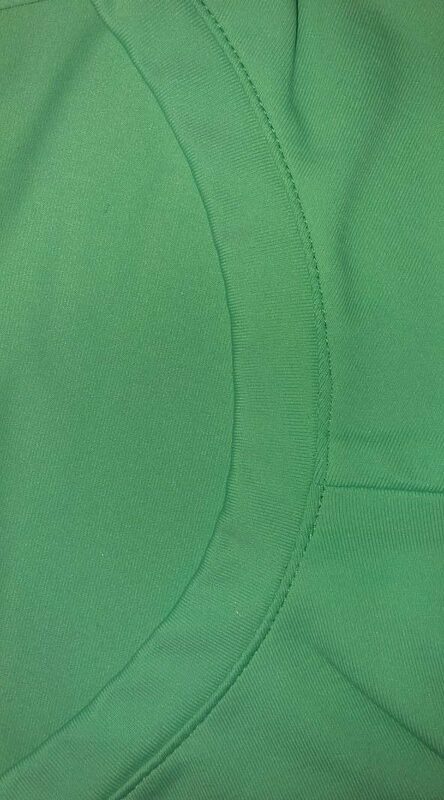 I stabilized the neckline and shoulder seams with narrow lengthwise strips of fusible tricot interfacing, fused at the seamline. I also fused 0.75″ strips of the tricot to the zipper opening. 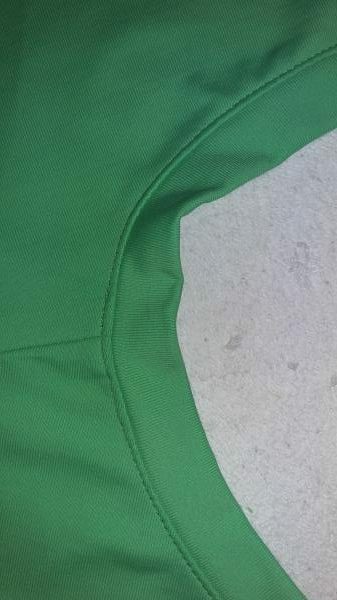 The neckline facings were interfaced with lightweight fusible weft insertion. The front flounce is single layer. The pattern instructions said to just zigzag the raw edge. Yuck! Lining would have made it less drapey, so I bound the edge with soft bias cotton/silk Radiance fabric in lime green. Those 1″ side seam allowances were sewn at the full 1″ at the underarms, tapering to 0.5″ at the waist and to the hem. This photo of the back is over-exposed; the others show the color more accurately. Finally, I just love the green-edged flounce! It can be draped in several ways. This is the final knit top I made myself last week. I liked New Look 6343, the pattern from yesterday’s post, so much that I had to make it again! This time, I used black Swiss 4-Way Stretch nylon/acetate/lycra from Gorgeous Fabrics (it’s the same type of fabric I used in the green top.) This was a piece left over from a top I made my daughter last year, and I had to really work to be able to fit the pattern pieces on! The white lace fabric for the sleeves was from my stash, from Emma One Sock, I think, several years ago. I’m not sure of the fiber content – maybe a poly or nylon mesh, with cotton motifs? In any case, I washed and machine dried it (although I’ll never machine dry the top) and it came out beautifully, although it did shrink a bit. I wanted the contrast to really show off those angled armholes! This top is dressier, but not so much that I can’t wear it with jeans. For this version, I did a FBA and added a bust dart, and I scooped out the neck about 1-1/2″ in front. I lengthened the sleeves about 1″ (standard for my long arms) and cut the top to the same hip length as the green top. I also used one size up for the sleeves, because this pattern is for knits, and the lace has a bit of mechanical stretch, but is not as stretchy as the black fabric. I also added about 3/8″ to the top of the sleeve cap. I pressed the seam allowances away from the sleeves and topstitched, so the seam allowances don’t show through the lace. I like the black cuffs on these sleeves! I think it adds a bit of a surprising touch. When making knit bands, such as the neckband and wristbands on this top, you stitch the fabric into a loop, then fold the loop in half and stitch the doubled raw edges to the garment. Easy, unless your fabric slides. To make it easier and allow you to use a LOT fewer pins, use water-soluble glue stick (sparingly) to hold the raw edges of the band together. No slithering, no uneven edges, and no twisted bands! When stitching a hem, use narrow strips of lightweight fusible web to “baste” the hem in place before stitching. I cut 1/4″ strips of Lite Steam-A-Seam 2, which is slightly sticky and repositionable, position them near the cut hem edge, remove the remaining paper, fold up the hem, and fuse in place. Then stitch. It keeps the hem from shifting and twisting. Lots of people use a double needle to hem knits, but for whatever reason, I have never had good luck with that method. So I just use one of the stretch stitches on my machine, play with the width and length and tension until I like the look, and stitch away! I think I’m done sewing for myself for a while. 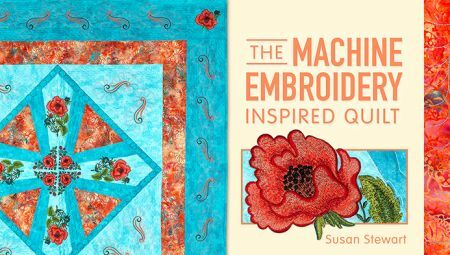 Now, it’s time to get to work writing instructions for a class, working on a magazine article, and quilting a challenge quilt. But at least I have some new clothes to wear!